• On-the-Spot Drops that offer quick “free-fall” prompts on different themes, such as short-winded poems and seven-line stories. • Mini Memoirs to unlock personal narrative to share, or not. • Suddenly a Story suggestions to explore feelings and states of being like fear, reluctance, compassion, kindness, anxiety, anger, jealousy, happiness, and more. • Surprise Yourself Surveys for those who think they know everything about themselves. • Untie-Your-Mind Word Lists to jump-start stalled imaginations. • Definition Decoders to introduce new ideas and styles of writing. 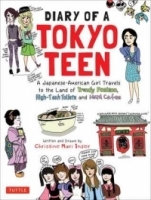 Created especially for tweens, teens, and other earthlings, this book provides you with a chance to create imaginative poems, stories, fragments, and real-life on-the-spot sketches. All that’s required is that you take a breath, relax, reset, and leap write in! 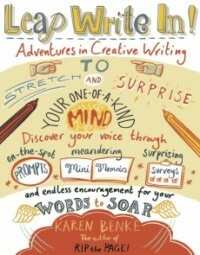 LEAP WRITE IN is a comprehensive tour of a writer's inner thoughts, emotions, and memories while also providing opportunities to flex one's creative muscles by trying new styles of writing. There are prompts for poetry, stream of consciousness, memoir writing, and sensory descriptions, among other things. Emerging writers will find this a handy tool to use in discovering their voice and in learning new ways to approach the craft of creative writing. The only drawback was the occasional odd approach to an exercise. Like explaining how to imagine oneself as something or someone else by saying that the author used a Shaman to guide her into mentally shapeshifting via the phone. Those occasional "new age" feeling anecdotes felt out of place to me. Overall, this is a tremendous resource for emerging writers, and would indeed be a useful tool for creative writing teachers as well.